This is becoming one of my favorite pally cards, especially with Chromaggus on board. Remember, you can heal your Tirion Fordring or Dr. Boom with this and not just your face! I see this card as a better version of Sprint but for paladin (or at least serves a similar purpose). 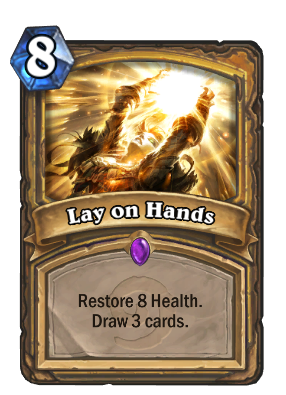 I love this card in my control Paladin deck, has saved me many times/ swung the momentum back in my favor (however I think only one is needed in a deck) It probably has no place in an Aggro paladin deck due to its high mana cost for no offensive potential besides the cards you draw from it, but if you want to include it, be my guest. Aggro Paladin has their draw engine in Divine Favor.